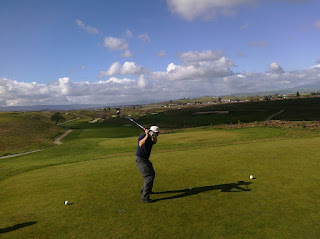 Battery died after this shot, so there will be no traditional 19th hole wrap-up pic. 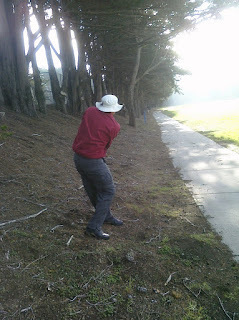 Instead we end with my equally traditional corkscrew finish, which miraculously followed a decent tee shot down the left side, on the way to bogey. 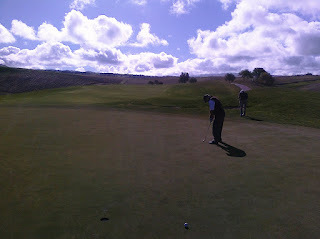 Team finished -18, tied for first but lost on the tie-breaker. 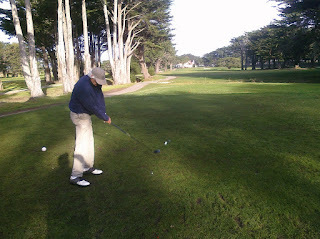 Roy hits his 3rd ball in the water. Cormorant and mallards scramble for cover, while Carolyn looks on in amazement. 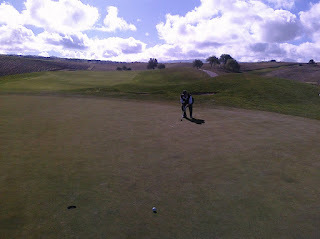 And a two putt par. Carolyn has the bad luck of being put in our foursome. We used to work together at Oracle. 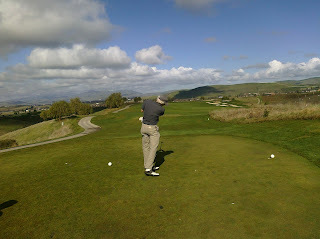 OGC Tournament with Roy and Rick. I apologize for this post being a long time in coming. 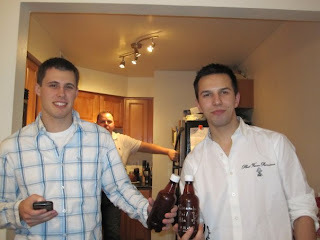 EPA Bottle 13 and Andrew's Bottle (# is unknown) were consumed on the twenty-third night of January 2010. 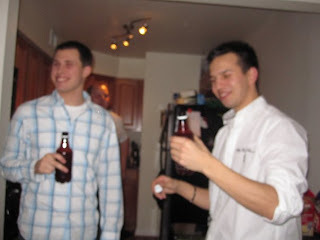 It was Andrew's going away party. For those of you who don't know, Andrew was leaving for basic training on January 27th. Andrew and I had decided that we would start the night off by drinking a beer that had been made with our own sweat, labor, and intellect: Escanaba Pail Ale. What do they know. We made it, soo it must be safe....Bottles raised, we toasted to a good night, a safe journey for Andrew, and for Andrew to make an acquaintance with a camel preferably female for his sake. The rest of the night couldn't have gone any better. Andrew made it safely to Fort Jackson in South Carolina. The army did not turn him away for having any strange toxins in his blood. Its been over a month since the tasting and we both are alive and well. I hope everyone enjoys EPA just as mush as we did. Looking forward to the next brewing. Hopefully we will have a better supervisor who has more faith in us next time. Or I get promoted to supervisor because of my excellent work record and the current supervisor has to experience what it is to be like a common laborer. It will help him to become a better supervisor one day. A couple of thoughts. 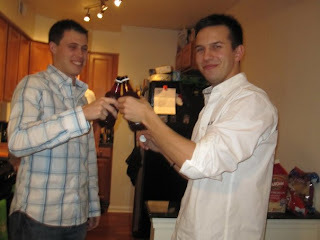 One - as I explained to both Brian and Andrew, Escanaba Pail Ale is a bottle conditioned brew. This means the final fermentation took place in the bottle and the sediment is normal - even desirable. 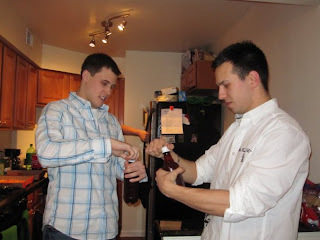 Two - neither of these guys has any idea about how to drink a bottle conditioned beer,. The proper method is to pour the brew off the sediment into a glass, where the bouquet, color, head and taste can be properly appreciated. I blame myself. 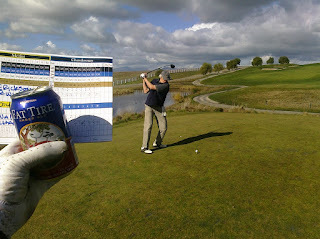 I had no idea that my supervisory responsibilities would still be required to help them actually drink the beer. Still, an excellent report and perfect occasion for an EPA. Good luck and godspeed to Andrew in his service to our country. Roy did not make it into this shot. He was too humiliated about the 14 trees he bruised. Ran into Butch Larroche in the bar. 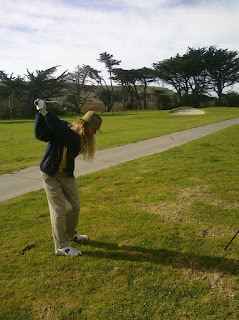 Up until now, I only knew him online from the Sharp Park battle blogs. 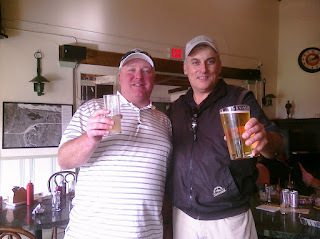 As it turns out, we'd rather have a beer and talk about golf & football (Green Bay is getting crushed 17-0), than CBD or Plater. 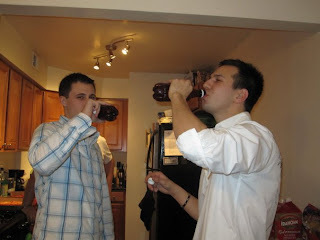 Still, this toast is for you Brent. 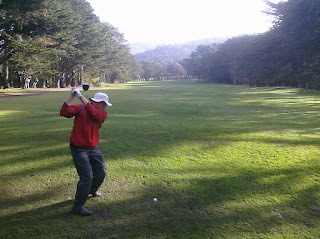 ...fail to catch the usual reliable slice and wind up on the 17th fairway. 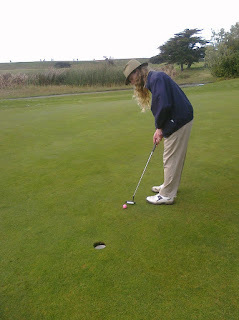 So I casually say to Adam that his par putt is a "knee-knocker"
He shrugs his shoulders and says "not really". 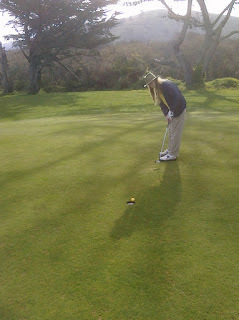 Then he misses it for a three putt bogey. Some people never learn. 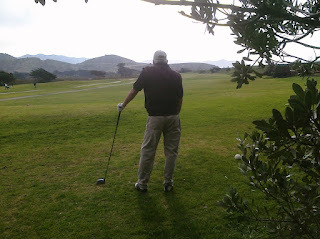 That is his son running toward his tee shot in the very far distance. 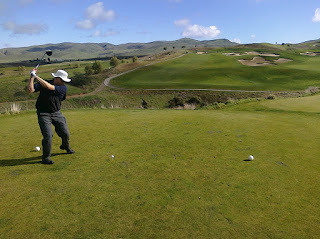 That is my tee shot in the foreground. 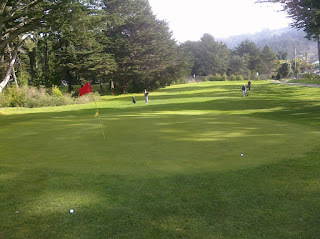 I three putt from here. UPDATE: Croppedand edited the fox pictures to see if we could get a little closer image. Good looking animal. 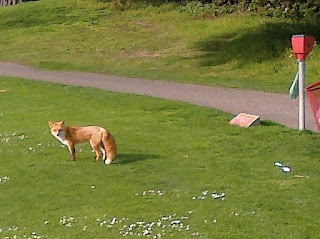 Non-plussed by golfers and looking well fed, healthy with a pretty coat. Must be that red-legged frog diet. drano. 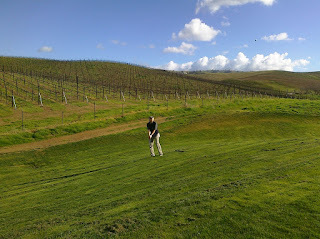 Adam owns this hole. 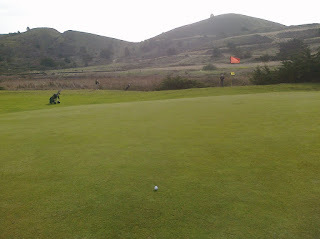 Neither Zwick made it to the hole. 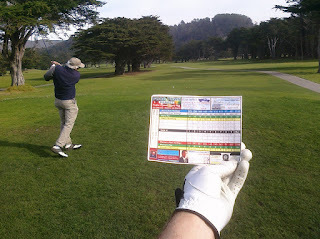 So now he only has hit 7 trees in 7 holes. 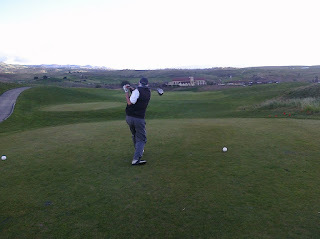 230 yards in the middle of the fairway. It looks good at this stage of the swing. After hitting his 4th and 5th tree. 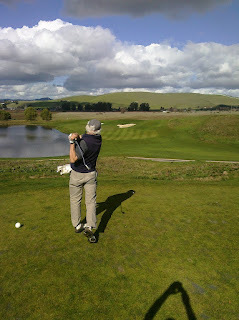 On his way to a bogey and a skin. 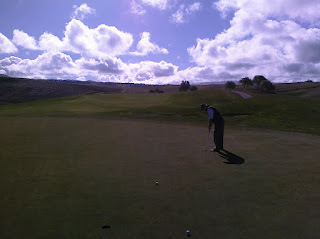 Playing with Roy, Rick & Adam. To be fair, he hasn't given anything away yet. 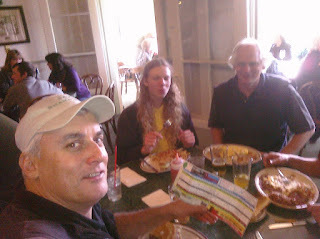 I am just working up some ideas, should Mirkarimi decide to run for mayor as some expect. 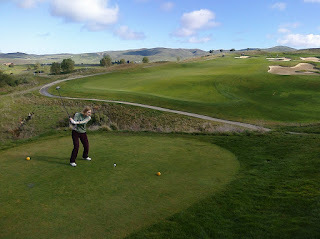 Some context - I have been blogging about the Sharp Park Golf course controversy for a number of months. For reference, the full thread on this blog is linked here, a background post here, good overviews in the San Francisco Chronicle here and here. 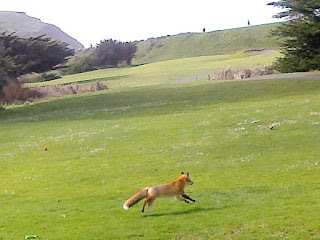 In a nutshell - Last year, the Center for Biological Diversity (CBD) wrote a letter threatening to sue the city of San Francisco alleging golf operations at Sharp Park were harming two endangered species. In March of '09, Supervisor Ross Mirkarimi sponsored a resolution to study alternative solutions to the problem, including keeping, destroying or modifying the course. The recently released report was approved by the SF Park & Rec Commission. 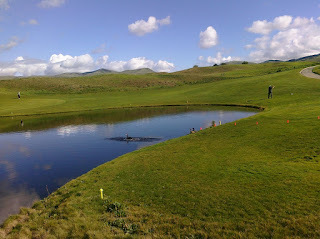 It recommends continuing the course operations, with modifications to enhance the habitat for the endangered species. The CBD and their allies continue to advocate a different course of action. 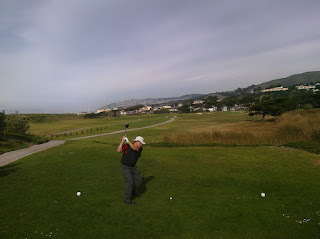 They want the City to destroy the golf course and give the land away to the National Park Service, specifically the Golden Gate National Recreation Area (GGNRA). Supervisor Mirkarimi, while non-committal, seems sympathetic to that plan. Ok. So, as my time ran out Supervisor Mirkarimi slapped me down pretty hard. That is fine. This was his committee and his venue, and he gets the last word. But this is my blog, and I get the last word here. Now I know that this will come across as a "Damn, I wish I said that..." post, long after the moment has passed. It will come across like that because... that is exactly what I am doing. 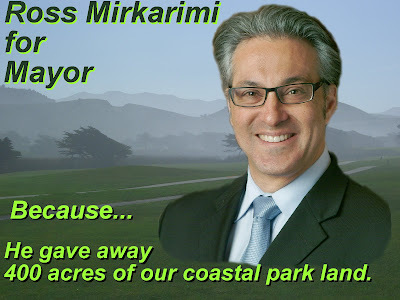 While I was loaded for bear on Sharp Park minutiae, I was ignorant of the history of Crissy Field and the GGNRA as I stood in front of Supervisor Mirkarimi. I am less ignorant now. 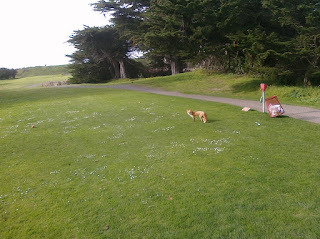 So how about a little "compare and contrast" between Crissy Field and Sharp Park? 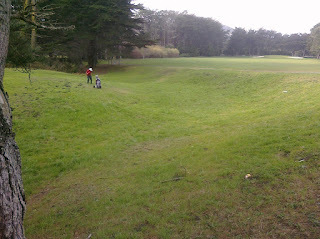 Crissy Field was an airfield, built on landfill, that since 1915 was Part of the Presidio Army Base. Congress decided to close the base in 1989, and it was turned over to the National Park Service in 1994. It never belonged to the City of San Francisco. The 100 acre Crissy Field site was considered a hazardous waste dump, and over 87,000 tons of hazardous material had to be hauled away before the process of restoring the site could proceed. The Golden Gate National Parks Conservancy (a public private partnership), did an extraordinary job raising the tens of millions of dollars needed to restore the site during the tech bubble of the late nineties. In partnership with the National Park Service, the 100 acre site was restored for the recreational use of all, including a relatively small 20 acre tidal marshland. 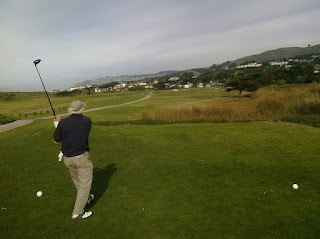 It is now administered by the Golden Gate National Recreation Area (GGNRA). As I suggested in my comments to Supervisor Mirkarimi, all involved did an excellent job with Crissy Field, converting 100 acres of federal land that was a hazardous waste dump into federal land that is now a wonderful park. Kudos. 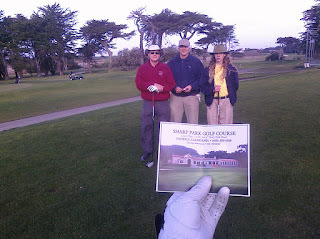 In 1917, the 400+ acres of land near Pacifica known as Sharp Park was bequeathed to the City and County of San Francisco by the Murphey family. The deed specified the land be used exclusively for park and recreational purposes for the benefit of all. 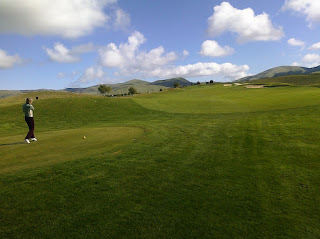 The golf course, comprising about 80 acres of that land, was designed and built by Alister MacKenzie, the world's most important golf course architect and opened in 1931. 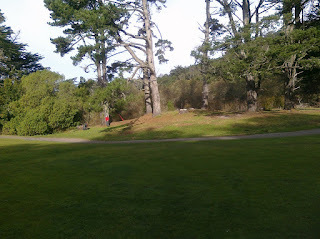 The park was landscaped by John McLaren, the godfather of San Francisco parks, including Golden Gate Park (which is also administered by SF Rec & Parks, not the GGNRA). 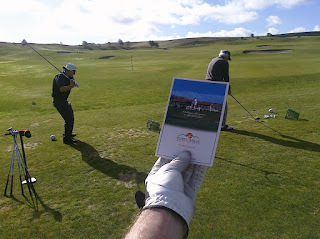 The park and the golf course are important historical landmarks by any standard. 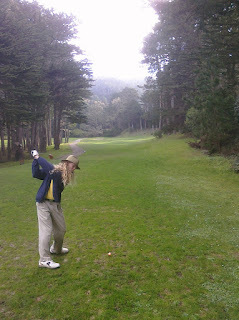 It is historically important to the city of San Francisco, the city of Pacifica and to the golf world in general. 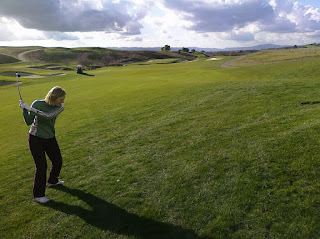 Over the years, millions of people have enjoyed the course, the archery range, the rifle range, the hiking trails and and the beach that comprise the park land. Today, over 54,000 rounds per year from Sharp Park help subsidize the overhead costs for the San Francisco Park and Recreation Department as well as other city services and jobs. The park is a unique gem that was a gift to the people of San Francisco, belongs to the people of San Francisco, and is a legacy for future generations of San Franciscans. Unless Supervisor Markarimi succceeds in giving it away. Crissy Field was a 100 acre federal landfill and hazardous material dump that was converted by GGNRA and private partners into a 100 acre federal park that The City could neither afford to restore or operate. 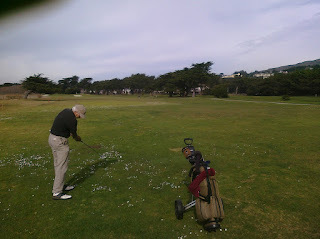 Sharp Park was a 400 acre oceanfront gift to the people of San Francisco. 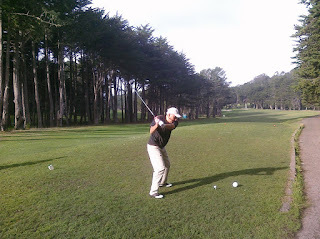 The park is home to an historic landmark golf course by the game's greatest architect, is enjoyed by hundreds of thousands of people every year, and helps subsidize overhead costs for the SF Rec & Park Department operations. I think it is safe to say they are different. So once again Supervisor Mirkarimi, I ask you - Do you want this to be your legacy? Do you want your footnote in San Francisco history to be this: "He was the man who gave away 400 acres of coastal park land that belonged to the people of San Francisco." I'll take my answer off-line. 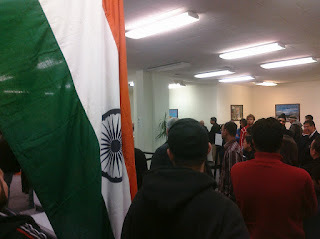 Your loyal blogger took this unauthorized photo of the line we found ourselves in when picking up our India Visas. Yes, the MW Mobile blog will be touring Northern India and Nepal in February. With visas in hand, and arms sore from vaccinations, it is getting real now. Undecided about bringing the Prē. The Sprint phone won't work, but I will be able to mobile link via hotspots. If there was a Google voice app for the Prē, it would be an easier call. Decisions... decisions.